(Colour approx. 14% light grey coloured matt emulsion finish). Textile intervention based on a mapping of Lahore Cantt. from 1893. 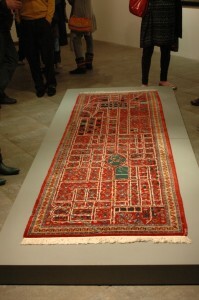 Antique tribal carpet with dyed sheep’s wool embroidery. Following upon the first war for independence or the Indian Mutiny the British Civil Station in Lahore moved to a totally separate area well outside the old city. This became the New Lahore Cantonment, which still exists as a whisper beneath the modern developments. This new Cantt. epitomizes what William Glover has termed “the colonial spatial imagination” in his book “Making Lahore Modern”.